Bruno Magli Black Leather Slingback Open Toe 2" Heels Women Size 9.5AA. Condition is Pre-owned. Shipped with USPS Priority Mail. This is in good condition. This is a size AA narrow. Size 6 1/2 AA. Brown leather. Made in Italy. 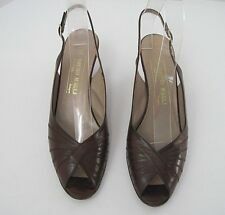 Bruno Magli Leather Slingback Sandals Size 9 AA Open Toe. Brown leather sling back sandals open toe with a square stacked heel Condition is Pre-owned. Shipped with USPS Priority Mail. Bruno Magli slingback pump heels. Pleat detailing. Heel height - 2 7/8". Made in Italy. Beige leather with patent leather front. Size 6 1/2 AA. Sling backs open toe. This is for a used pair of Bruno Magli Ladie's Slingback Heels in Black Leather. Gold tone designer front buckle. They are size 7 1/2 AA. Super amazing vintage heels that just. don't. fit. me. I'm so sad that I can't squish my sz 8 feet into these 70's glam shoes. So perfect with jeans or a dress. Enjoy! Bruno Magli Beige Leather Slingback Shoes Size 5 1/2 AA. Made in Italy. Very good condition. Insole length 9". BRUNO MAGLI Slingback High Heel Sandals. • size: 7 AA. • heel height = 2". • color: Red. Bruno Magli Black Leather Open Toe Slingback Sandals Heels 7 AA - Made in Italy. In excellent gently pre-owned condition. No issues. 2-1/8" heel. I am not always flaw-free and do make mistakes. The deep burgundy slingbacks have a peep toe and butterfly cutout design. The under soles are also leather. As shown in photos, shoes have minimal signs of wear. There are minimal scuffs on one toe (photo 7) & heels (photo 8). Bruno Magli Gunmetal Leather Open Toe Slingbacks 9 AA, Excellent Condition!! These shoes are in excellent pre-owned condition. The color is a darker neutral that can be worn with almost anything. Bruno Magli Made in Italy black fabric (matte) wrapped leather. Good pre-owned condition. These shoes are in wearable condition and show general wear throughout. Fair pre-owned condition. These shoes show heavy wear from previous use including heavy scuffs and creases and heavy signs of use to the insole and outsole. BRUNO MAGLI Red Slingback Open Toe PUMP. SF SIZE: 9-1/2 AAAA (Extra Narrow). Condition: Pre-owned. Designer: Bruno Magli. The vamp on this peep-toe heel is gathered snake-skin embossed leather secured in the center with plain bronze leather. The sides and heel strap are smooth bronze leather. The sole is glazed brown leather. 2-1/2" heels, in excellent condition. Made in Italy. Resplendent Italian shoes for that special occasion! In excellent condition. Size 6 1/2 AA. Black leather. Made in Italy. Size 6 1/2 AA. Blue leather. Made in Italy. Excellent condition with no scuffs, tears. Slight normal wear on the bottom. Bruno Magli Italy Womens Black Satin 6.5 AA Narrow Peep Toe Slingback 3.75"
Bruno Magli. Black Satin Peep Toe Slingback with 3.75" Heel. Designer: Bruno Magli. Includes: Bruno Magli box and shoe bag. Color: Taupe with suede and reptile accents. Otherwise perfect condition! BRUNO MAGLI. leather upper and soles. Size: 8.5 AA (insoles 10 1/4", width 3", heel 3" ). Color: BEIGE. MADE IN ITALY - Bologne. Excellent used condition. Unless otherwise stated, these shoes are preowned and do not have original box. MADE IN ITALY, FROM BLACK LEATHER WITH SNAKESKIN DETAILING. SIZE- US 8.5 AA. These classic but chic slingbacks by Bruno Magli are made with beautiful, high quality Italian leather and feature a 1 3/8" block heel and a buckle fastener. New in box. Size: 6 AA. They are a two toned heel that are beige and black. Sling back. Size 6 1/2 AA (Narrow). Silver and Gold. Signs of wear on soles. Adjustable heel strap with gold tone buckle. Platnimum & silver leather upper with gold sequin & beaded butterflies over the toes. Leather lined with leather sole. General Information: Our shoes are in the condition listed above. Note that there may be color shade and hue variances due to different monitors and device settings. Sales are final. Size 7.5 AA - Embossed on Bottom of Shoe - See Photo. WE’RE HERE & EAGER TO SERVE! PEACE, LOVE AND GUMBO Y’ALL! WE ARE HERE TO SERVE & ASSIST ANY WAY WE CAN! SHOES ~~15. We are here to take care of you. Beautiful black leather peeptoe shoes by Bruno Magli. peeptoe and sling back.